Zac (click for Zac’s profile): So this summer’s crop of tour guides is really exceptionally musical: almost all of us play in a college ensemble and do extracurricular music stuff. Min and I thought, since we both sing in an a cappella group, that it would be fun to write about what the college a cappella scene is like! 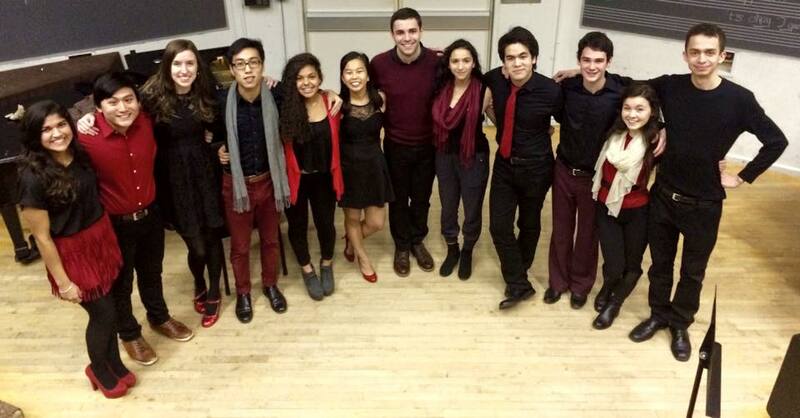 Min (profile at bottom): Swarthmore has five a cappella groups, and one of them (Chaverim) is a tri-co group — they have members from Bryn Mawr and Haverford too. All the groups hold auditions in the beginning of the academic year, and all class years are welcome to try out. My a cappella group is called Mixed Company. We were founded in 1991 as the first co-ed a cappella group, and we sing whatever songs the members like and arrange, ranging from “Woods” by Bon Iver to “Treasure” by Bruno Mars. Zac: I sing with a group called Sixteen Feet, which is the college’s oldest group (also, the only all-male singing group). We sing mostly R&B music (both contemporary stuff and throwback jams), plus a few rock or pop songs that we’ve smoothed out. We rehearse two hours at a time, three times a week. Additionally, we have a weekly meeting for dinner where we discuss the weekend, hang out, and talk smack on each other. Min: All the groups rehearse for six hours a week; it’s a good balance of getting work done and learning music while also managing to stay friends. The a cappella groups get pretty tight and often go on group outings; Mixed Company sometimes goes to a nearby milkshake place called Nifty Fifty’s, especially after concerts. Mixed Company poses for a group photo before Jambo Fall 2014. Zac: Yeah, similarly, Sixteen Feet is really close. We have a designated group “Social Coordinator” who’s in charge of planning & executing group hang out. Concert after parties are also a critical part of the social experience of a cappella. They give you a chance to bond with other people in your group as well as visiting “guest groups” from other colleges. What’s your favorite part of the a cappella scene, Min? Sixteen Feet acts out a skit before performing at Jambo Fall 2014. Photo by Bobby Zipp ’18. Min: I love performing! We spend over 70 hours preparing for each of our semesterly concerts, and to share that work with hundreds of students is amazing. Mixed Company isn’t afraid to let loose a little — we don’t take ourselves too seriously and conduct our concerts like a voice recital or a chorus concert. We have fun with it, usually joke around, and make the audience feel at ease. 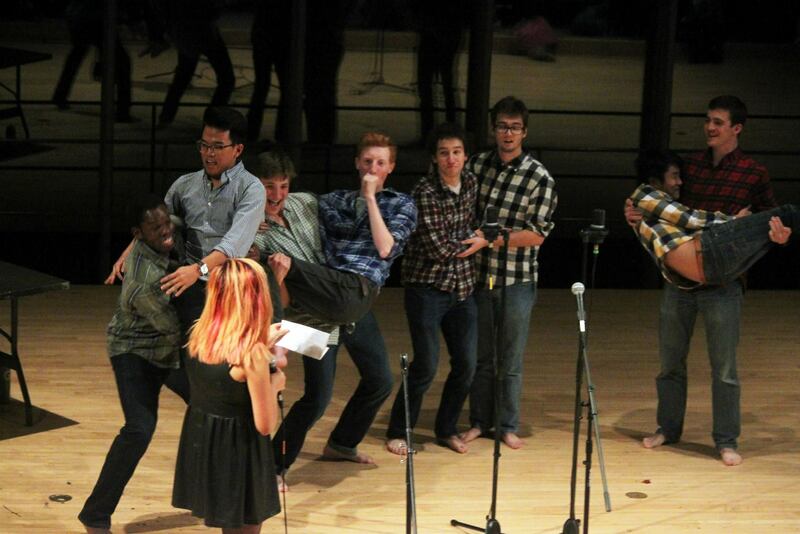 It’s truly a performance, and is one of the most rewarding nights of the semester for me. Mixed Company sings a mashup of “Rocket” by Beyonce, “Drunk in Love” by Beyonce and Jay-Z, and “All of the Lights” by Kanye West. Arranged by Murphy Austin ’16, solos by Kyle Leigh Carney ’16, Nora Kako ’15, Murphy Austin ’16, and Paolo Debuque ’15. Video available here. Photo by Bobby Zipp ’18. Zac: That’s great stuff, & I agree 100%. 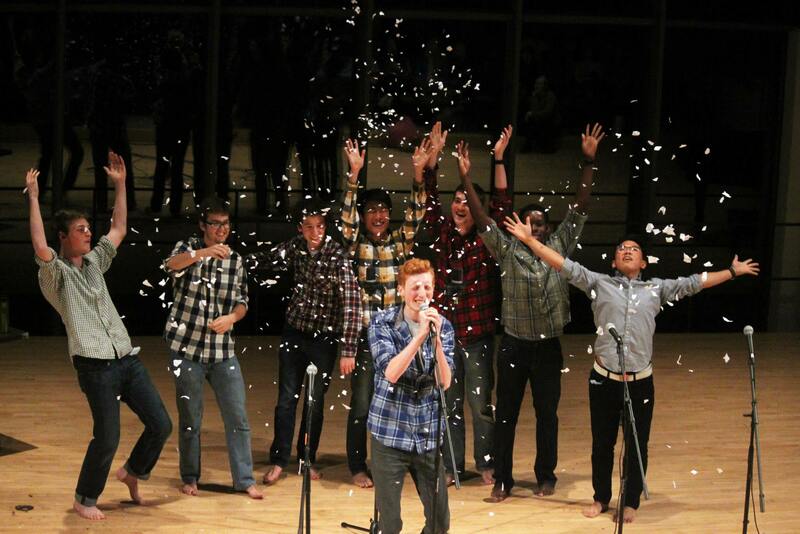 I think though, that my favorite a cappella events are the bellsings. Sixteen Feet sings in the Clothier Bell Tower pretty regularly, but when all the groups get together & sing there it’s always a lot of fun. The bell tower environment is really casual and singing outside with your friends is a great way to waste a couple hours! Min: Def, def. The club fair in September always tends to bring in a lot of auditioners because all the groups do a little performance right before the new first years get to sign up for clubs. I myself was really impressed by all the groups, and signed up for three auditions that day! What’s the Feet audition process like, Zac? Zac: I knew I wanted to audition for Feet after I saw them sing “Fell In Love With A Girl” in the bell tower when I was a prospective student still in high school. When I got to the College they had me sing a short solo, as well as some scales to test my range. Last, they had me sing in parts with the group to test how good my “blend” is (how well I can match my voice with the other members of the group). Sixteen Feet was the only group I auditioned for, & I found out that I got in after about a week – right at the start of classes. Min: Some groups, though, have callbacks. 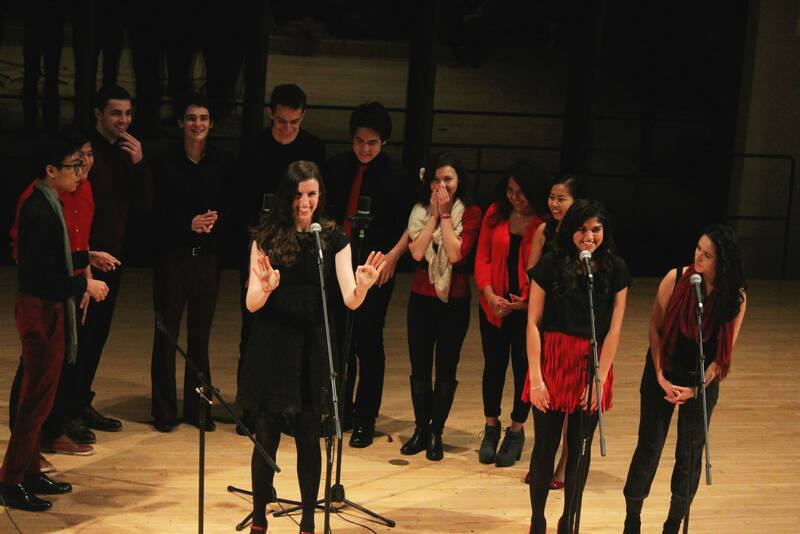 When I auditioned for Mixed Company, I sang a short solo — just a verse and a chorus of a song. Then, they tested my range, and they pushed me to my very upper limit. I sang notes I didn’t think were possible. Apparently, they were impressed, because they had me come back that Sunday afternoon for a callback. I don’t recall the exact timeline of events, but I learned one of their songs from the previous year, surreptitiously and maybe illegally rehearsed it with some other auditioners in a practice room, and went back in to sing it with MoCo. They also had me sing “Somewhere Over the Rainbow” and instructed me to do it chorally, with a very pure tone. My guess is that they want versatile voices that can handle any type of song that they might want to sing! But I’ll know for sure when I get to be on the other side this fall. Zac: Being on the other side of the audition process is actually really cool, but also very intimidating. There were definitely auditionees this past year that I was really excited about & it was everything I could do to keep from jumping up & down about how good I thought they’d be in the group – but I had to work to keep my cool. It’s great, especially as music director, to think about that the future of the group is going to be like & then pull in freshman guys that are going to make that vision a reality. That’s something I spent a lot of time with at the start of this year & it really paid off dividends – I’m super happy with our frosh this year & it’s extremely satisfying to see them grow as musicians (and as the dudes who are going to lead the group in just a couple years!). Sixteen Feet throws confetti as Wilden McIntosh-Round ’17 solos on “Have Yourself a Merry Little Christmas”. Other solos by Zac Arestad ’17 and Ben Charo ’18. Arranged by Zac Arestad ’17. Photo by Bobby Zipp ’18. Min: A cappella is a lot of fun! Sharing music with people is almost magical, and I don’t think any of us would rather be doing anything else. See you at auditions, or at our next concert!